JOHN DEERE TRACTOR OEM CARBURETOR MODEL M 320 MARVEL SCHEBLER TSX CARB. JOHN DEERE CARBURETOR MARVEL SCHEBLER TSX 2-11/16 BOLT PATTERN FOR MODELS - M, MT, 320. HERE WE HAVE A REAL NICE FULLY RESTORED MARVEL SCHEBLER CARBURETOR. SINCE THIS ONE HAD BEEN SITTING FOR YEARS IT RECEIVED A FULL PROFESSIONAL RESTORATION TO MAKE SURE IT'S 100%! NO SHORT CUTS, EVERY ORIFICE CLEANED - NEW SEALS, GASKETS, SCREWS, FUEL INLET WITH SCREEN, STUDS, FLOAT VALVE, BRONZE THROTTLE BUSHINGS ARE INSTALLED & PRECISION SIZED TO PREVENT AIR LEAKS. AFTER THE REBUILD IT WAS PUT ON A RUNNING ENGINE FOR TESTING AND FINE TUNING, IT REALLY RUNS GREAT! YOU WILL NOT BE DISAPPOINTED WITH THIS ONE! ALL MY CARBURETORS COME WITH A 100% GUARNATEE. I HAVE OVER 30 YRS. PROFESSIONAL EXPERIECNCE REBUILDING CARS EQUIPMENT AND OLDER TRACTORS. WE NOW RUN A SMALL REPAIR SHOP THAT SPECIALIZES IN ANTIQUE CARBURETOR RESTORATION. JUST LET ME KNOW IF YOU HAVE ANY QUESTIONS OR SPECIAL REQUESTS. DAN'S AUTO & CARB. Most of my Crystals & hair accessories are made to order. I love to make beautiful items for Weddings or Special Events and have had many years. My husband being the talented man that he is has been taking in knowledge for over 35 years of tearing down and rebuilding practically any thing that has a motor and wheels on it. He has many happy customers and you can read several hundred feed backs to view on our listings. My husband and I have been married for almost 31 years, married young so we basically grew up together and have been each others best friend through thick and thin. We live in a pretty rural area in Northern California which has been a great place to raise our kids and play with our three other four legged kids. I do hope you know you can trust us as sellers we hope to have the chance to share are products with you, thank you for your time! Get Supersized Images & Free Image Hosting. Create your brand with Auctiva's. Attention Sellers - Get Templates Image Hosting, Scheduling at Auctiva. 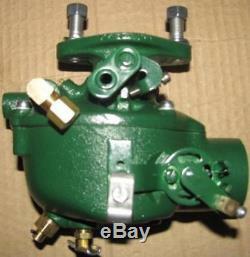 The item "JOHN DEERE TRACTOR OEM CARBURETOR MODEL M 320 MARVEL SCHEBLER TSX CARB" is in sale since Friday, November 16, 2018. This item is in the category "Business & Industrial\Heavy Equipment, Parts & Attachments\Heavy Equipment Parts & Accessories\Antique & Vintage Equipment Parts". The seller is "danstractorsupplies" and is located in Cottonwood, California. This item can be shipped to United States, all countries in Europe, Canada, Australia.